The bush roads run a hundred kilometers north of where I’m sitting right now. They cut trees up there, lots of small trees, some less than 5 inches in diameter. And they truck these trees almost 240 kilometers south to the mill. None of the northern stretches of these roads are paved, and the potholes tear the suspensions out of the pickups and logging trucks. One of the main features of day-to-day work is equipment breakdown. This afternoon, a Sunday, one skidder ran low on antifreeze. A Terex rock truck blew a brake line. A rogue log punched a pinhole in a hydraulic line on one of the big excavators. A feller-buncher developed problems with the cutting head rollers. The automatic transmission just started jumping and slipping on one of the pickup trucks, and a front universal joint has just started making noise on one of the others. And a tire went flat on the service truck. Buying and installing parts is a full-time job. Yesterday, we went for a ride to a scrap yard run by Larry in the next town, about 20 kilometers away. 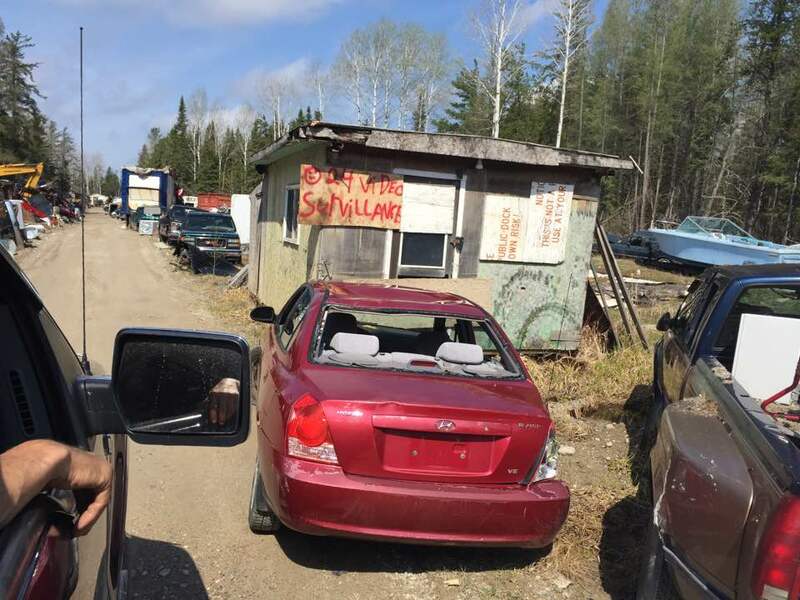 The ‘scrap yard’ is just a narrow, 2-kilometer-long road through the bush lined with wrecks. Tractor trailer rigs crushed in highway accidents, old school buses, ATCO trailers, pickup trucks stacked one on top of the other, and cars of every make imaginable, from new to 60+ years old. We were looking for a late ’70s Cummins diesel engine to replace the one that had blown in the heavy equipment flatbed float truck. And there it was, in an ancient tow truck. And, yes, with some coaxing, it ran, and it ran pretty well. Larry’s price: $2000, firm. Larry, himself, is a balding man in his late 60s. He has a grown son and 7 young stepkids. He lives in a white bungalow encircled by vehicles at the end of wreck road. If a visit to Larry’s—thick bush, dirt road, twisted wrecks, hot sun and blackflies and all—wasn’t hell enough, I decided to take a walk through the little logging town this morning. The main street is wide and desolate. One of the local multiplexes wore a small FOR SALE sign. There were apartments upstairs with a computer store on one side, Lady Diana’s beauty salon in the middle, and a two-bay car wash on the other side. A sign in the salon window read “out of business”. While our resources in northern Canada may be ‘natural’, our methods of sustainably interacting with them are decidedly not. Nothing happens out here without massive quantities of gasoline and diesel fuel. And cutting blades. And waste, lots of waste. Felled trees left to rot along the roadsides; towns filled with oily industrial sites and broken equipment. Any thought of finding human-designed aesthetics would be misplaced. This is all extraction and no art. These local images led me directly to the beneficiaries of our Canadian industry: big cities in the south with galleries, restaurants, concerts, boutique shops, luxury cars, groomed parks and well-dressed urban dwellers. In Canada it takes many small hells to make a half-dozen glittering cities. Which got me thinking about Canada’s other, not-so-nice cities. Every year there’s another list of Canada’s worst cities. Some examples are New Glasgow, Saint John, Thetford Mines, Sarnia, Thunder Bay, Nanaimo, etc. They all share one thing in common, a close proximity to toxic, resource-based industries: mining, forestry, oil refining, which is not only bad for health and aesthetics, it’s bad for the planet. We Canadians not only rip a lot of resources from the earth, we consume and pollute among the best/worst in the world. Last year Canadians were one of the highest greenhouse gas polluters at 18.8 metric tonnes per Canadian, just behind Americans at 19.8 tonnes and Australians at 20.6 tonnes. In the same year Canadians also experienced 15 percent increase in wealth, by far the world’s highest rate of growth. Sadly, whether we live in Timmins or Toronto, that’s just who we are: environmental predators.